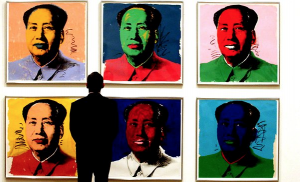 Andy Warhol and David LaChapelle both tackle Mao Zedong. The Chinese Communist revolutionary and the founding father of the People’s Republic of China. 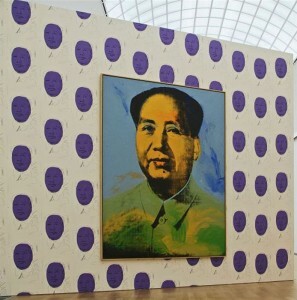 Warhol approaches Mao as portraiture .The enforced ubiquity of Mao‘s image in China and its resemblance to a silkscreen instantly attracted Warhol. LaChapelle, on the other hand, is intrigued by Mao as currency. 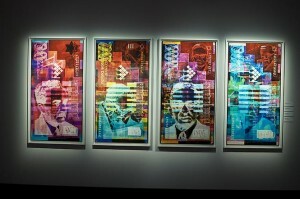 He transforms the well known Yuan, which features Mao‘s portrait, into a work of art. The influential Pop artist Andy Warhol cast a cool, ironic light on the pervasiveness of commercial culture and contemporary celebrity worship. Early in his career, he began to utilize the silkscreen process to transfer photographic images to canvas: images of mass-produced consumer products and Hollywood film stars are among his most recognizable subjects. In this example from his Mao series, Warhol melded his signature style with the scale of totalitarian propaganda to address the cult of personality surrounding Chinese ruler Mao Zedong (1893–1976). Nearly 15 feet tall, this towering work mimics the representations of the political figure that were ubiquitous throughout China. In contrast to the photographic nature of the image, garish colors were applied like makeup to Mao’s face. Ultimately, the portrait shows Warhol at his most painterly, rendering Mao, an enemy of individualism, in a brazenly personal style. David LaChapelle is a fine art photographer, film director, commercial photographer, music video director and an artist from America. He is widely known for his photography which mostly references art history and often shares social messages.